The words ‘Amazonian rainforest’ conjure up a multitude of images in the mind – waves of trees stretching to the horizon, rivers winding sinuously through the forest, the calls of birds and mammals, and exotic flowers. There is no place on earth like the rainforest and the Peruvian Amazon provides all of this and more. If you have decided to make a trip to South America, make sure that you schedule an Amazon river tour. There surely could be no more fitting place for beginning your Amazon River cruise in Peru than Iquitos – a city that can only be reached by air or water; there are no roads from the outside leading to this settlement in the rainforest. However, as far as Iquitos may be far from the beaten path, you can rest assured that it has all the good weather conditions necessary to make your stay comfortable. Actually located on the confluence of 3 rivers, the Nanay, Amazon, and Itaya, Iquitos is a unique and intriguing city with many points of interest, as well as excellent restaurants and lodgings. The temperatures and climate in Iquitos mirror those of the surrounding Amazon rainforest high water and low water seasons. On average, the temperatures in Iquitos are high, ranging from 70 - 91 F (21 - 33 C). Summer in Iquitos (November - May) is rainy and humid. In May, the Amazon river that surrounds Iquitos reaches it’s highest point. Winter in Iquitos offers a different climate, sunny days and nice weather, with an average of 90 F (32 C). Iquitos regularly has microclimates, meaning, rain can be present in one area of the city, and sunshine in another. Lastly, Iquitos suffers from a phenomenon called “urban heat island.” It’s where heat has difficulty dissipating into the night hours, since the urban climate of Iquitos, is hotter than the natural climate of the Amazon jungle. The high water season goes from December to May when the rivers are at their highest. In fact, the Amazonian rivers rise nearly 25 feet during this time, allowing increased access not only to otherwise impassable creeks and streams, but also permitting penetration into the rainforest itself by boat. During the high water season the Amazon rainforest temperature will generally top out at about 86 F (30 C), and the relative humidity will also be very high. However, this will probably be the best time to observe the incredible wildlife that Amazon River travel can show you; pink dolphins, giant river otters, Amazonian manatees, night monkeys, pygmy marmosets, giant river turtles, and ocelots, and many other species are all to be found in or near the rainforest rivers. Birds also present a dazzling spectacle in the high water season – white herons, toucans, jacamars, and brilliantly colored macaws abound. The low water season is hotter than the high water, with Amazon temperatures reaching into the middle to high 90s F (34+ C). To compensate for the higher temperatures, however, there will be less rain and fewer mosquitos. 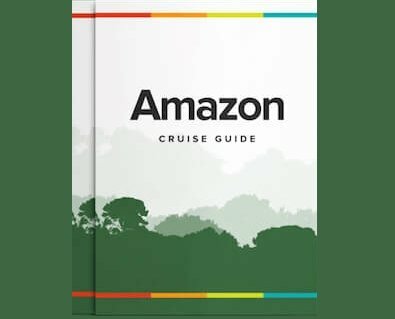 As the waters recede from June to November, your Amazon cruise can be augmented by dry land explorations. Wildlife will still be flitting through the trees or swimming through the water, although it may not be as obvious as it was during high water. If you enjoy fishing, however, this is the perfect time to cast a line into the water as the lower water levels have served to concentrate the fish to a degree. Both the high water season and the low water season in the Amazon rainforest are the best seasons to visit Iquitos, the rainforest or Peru – you can never be disappointed regardless of when you go. The best solution is to choose a date that best fits your schedule. We are sure you’ll enjoy the Amazon rainforest either way. Get in touch with us at Rainforest Cruises to start planning your Amazon river tour in either the dry season, or the wet season!